Enjoy each saucy bite of our fall-off-the-bone baby back ribs. 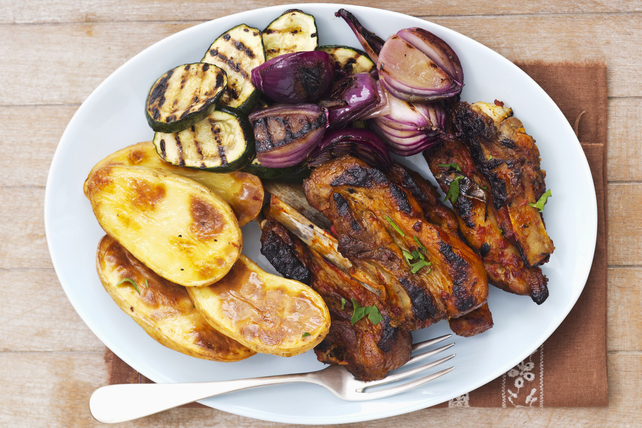 These pub-inspired ribs are baked, then grilled to tender perfection, along with cut-up fresh vegetables, to complement your meal. Line 13x9-inch pan with foil; spray with cooking spray. Combine first 4 ingredients; rub onto both sides of ribs. Place in prepared pan. Bake 1 hour. Remove from oven. Heat barbecue to medium-high heat. Cover barbecue grates with additional foil; spray with cooking spray. Toss vegetables with dressing. Transfer ribs from pan to barbecue. Grill 5 min. Add vegetables to barbecue. Grill ribs and vegetables 10 min., turning ribs and vegetables occasionally while brushing ribs with barbecue sauce. Cut 2 lb. (900 g) baking potatoes into wedges, cutting each potato into 4 wedges. Spread onto rimmed baking sheet sprayed with cooking spray. Drizzle evenly with 2 Tbsp. Kraft Extra Virgin Olive Oil Fig Balsamic Dressing. Bake in oven along with the ribs. Serve with the grilled ribs and vegetables. Ribs have a membrane on the bone side that should be removed before cooking for easy eating and to allow the barbecue sauce to best flavour the meat.